Say hello to this quick and healthy recipe! It’s loaded with six serves of veg and is beautifully balanced with low GI carbs and lean protein. This has become my go-to recipe when I get home from work and don’t know what to make or have leftover rice from the night before. With only one pan to clean up, this is an ideal throw-together meal. While brown rice is my go-to, I honestly think that some recipes taste better with white rice (hello light and fluffy texture)! I like to use naturally Low GI white rice from SunRice (which you might already know as Doongara or Clever Rice). I’ve been eating it for years and it’s become a convenient pantry staple. As I love the product a whole bunch, I’ve also started working with SunRice. SunRice Low GI white rice has a lovely new look packaging! In case you don’t know, choosing Low GI can help give you a sustained energy release – which is why I choose low GI products. Plus, rice is naturally gluten-free so that’s handy if you can’t eat gluten. If you’re sensitive to gluten, simply swap out the soy sauce in this recipe for gluten-free tamari. Why is this white rice low GI? SunRice Low GI White Rice is a variety of long grain rice, called Doongara, which is exclusively grown in Australia. It’s naturally low GI food to provide sustained energy release. So you know, for the past year I’ve loved working with SunRice to create a whole bunch of stuff including this recipe. I’ll be sharing some more recipes from this collaboration with you soon. Any way, I hope you enjoy this simple, healthy and easy recipe! 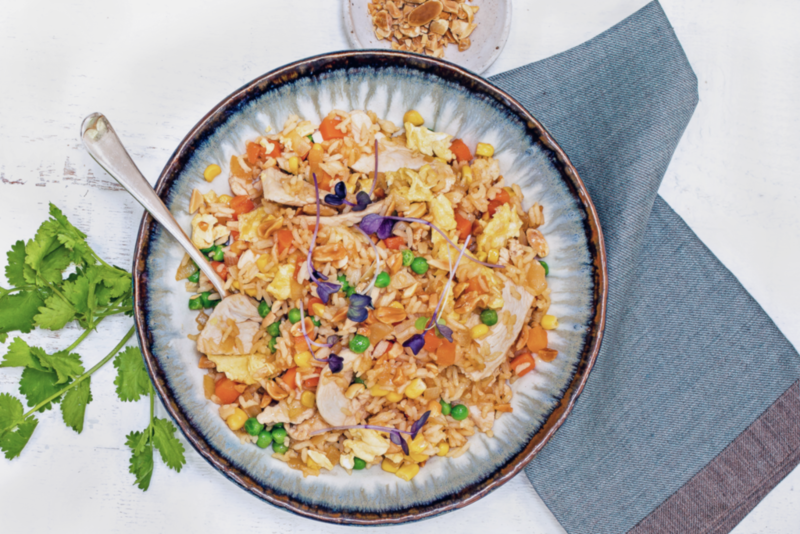 All you need is some cooked low GI rice, a few key ingredients and one fry pan to pull together this healthy, tasty meal in 15 minutes. Peel onion. Chop onion and cauliflower by hand or blitz in a food processor until coarsely chopped. Heat oil in a large frying pan. Once hot, add onion and cauliflower and cook for 3 minutes. Add chicken to the fry pan and cook for a further 5 minutes. Add peas, corn, carrot, rice, soy sauce and fish sauce to the pan and cook for 5 minutes. Crack the eggs into the frypan and stir until egg is cooked (around 1-2 minutes). Serve with toasted crushed peanuts or sesame seeds as garnish. Disclaimer: Yep, it’s true. I love SunRice! That is why I partnered with them as their Health and Wellness Ambassador. Thanks to SunRice for giving me the chance to create this recipe!